We spent our last day visiting the Abba’s House Children’s Center in Cien Fuegos. We arrived to a group of smiling faces, full of energy and excited to greet new visitors. From the first moment there, you could not help but fall in love with these wonderful children. The center is run by Pastor Jose Rodriguez and his wife Anyolina, a ministry we have adopted and that now serves as the official Abba’s House representative in the Dominican Republic. The center feeds and teaches over 100 of these precious little ones every day, and we are excited about the plans for their future, and the possibilities of feeding and ministering to even more in months to come. Jeremiah 29:11 says that God know the plans He has for us… good plans for a future filled with hope. We believe that God is going to do great things through the ministry of Pastor Jose, and use him to offer a bright future to many children. While we were at the center, a small group from the team went to “the landfill”. What they saw there broke their hearts. The landfill is an actual landfill where the garbage and refuse from all over Santiago is brought and dumped. It encompasses hundreds of acres, and is filled with flies, stray dogs, cattle (and the waste they bring), and hundreds of people – many of them children – who scavenge for food, as well as discarded items that they might be able to resell. Almost ALL of the children from the Children’s Center were rescued from this very life, but there are so many more to rescue. After our visits, it was time to get ready for the final crusade. What had been a beautiful day became cloudy, and while we were on the way to the stadium, the bottom fell out. It poured, turning the infield of the stadium into a muddy mess. Still, it did not deter thousands from coming to get a fresh touch from God, and find healing and deliverance at the foot of the cross. I shared the pulpit with Pastor Ronnie Jr. as we told the story of Jesus healing the woman with the issue of blood, and raising Jarius’s daughter from the dead. Pastor Ronnie gave an invitation for salvation, and many, many people prayed to receive Christ. He then gave an invitation for those wanting to be healed. Hundreds of people flocked to the stage to be prayed for. Our team, as well as local pastors prayed for those who came forward. 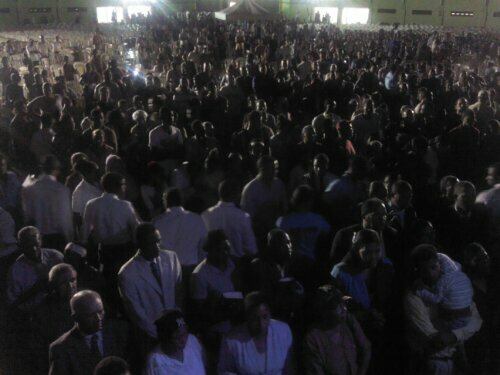 The pastors then gathered at the front of the stage, and we prayed a blessing over about 100 of them. This has been a glorious trip, and I want to just say a word of thanks to all of you who lifted us up in prayer. Your prayers were felt every step of the way, and encourage us to look forward with great anticipation to what God is going to do in the future in Cien Fuegos.